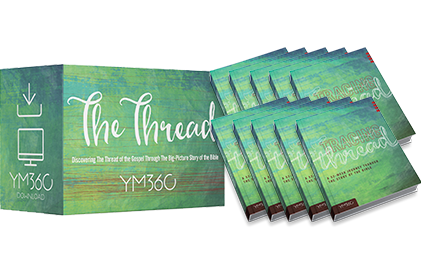 Teach The Thread, a 52-lesson Bible study by YM360, and help students discover the life-changing narrative of the Bible, from Genesis to Revelation. But most important, show them how the thread of the Gospel is woven through every story. BUDGET SAVER! The Thread includes access for unlimited teachers within your church! NO SHIPPING! The Thread is downloadable and available as soon as you purchase. Purchase the Thread Curriculum Devotional Bundle and give your students a premium devotional experience that helps them grow deeper in their study of God's Word alongside your lessons each week. Includes Curriculum + 10 Devotional Journals to get started with options for adding more! Download the scope and sequence for The Thread, a 52-lesson curriculum! Get an up close look at a lesson plan. You'll get both PDF and DOC for each lesson! You'll get 5 weekly devotions to post on social media, your blog, or church website ... or purchase our Tracing The Thread Devo Journal and watch your students grow deeper alongside your lessons weekly! Each lesson in The Thread features a Teacher Prep Video. These short videos help guide your teachers in exactly what to focus on in their lesson preparation.